"Artists have been longing to have the freedom to use video image, animation and sound on the Internet to enhance their artistic expression. Streaming media has made their dream come true. With the introduction of this new media, you can now create your own unique artwork that has the same effect and power to express as the radio and television. However, up to now, there was not much innovative use of this media in the art world. Thence MCMOGATK encouraged artists to make use of streaming media, the most exciting tool of our times that has the greatest potential as a medium of artistic expression. " 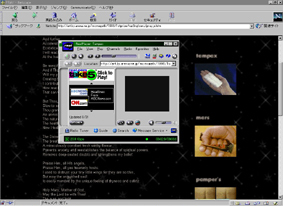 The "Art on the Net" was founded in 1995 as a festival for the "Internet art". This year, we had over a hundred works from 19 countries under the theme "The Age of Streaming Media - 'Beyond Language Barriers'" The "Art on the Net 1998" is organized by MCMOGATK (Machida City Museum of Graphic Arts) and The Art on the Net Exhibition Committee, in cooperated with NHK Engineering Service Foundation, Computer Graphics Art Society, High-tech Visual Promotion Center, Japan Digital Archives Association, and Association of Media in Digital.